I’d like to start by saying a big thank you to everyone who braved the cold winds to join our rally at the University to fight these cuts. It was felt that the event was a good success with fantastic speeches by Lucy Spencer (a student from Health Sciences), Ben Exton (a Chemistry Student), Hwyel Williams MP & Rhun Ap Iorwerth AM and Angharad Tomos from Cymdeithas to name a few. The content of the speeches and clout of the speakers alongside the widespread coverage of the Rally is sure to have got the University listening to our concerns about the cuts and equally has publicly exposed that their frivolous building programme, not student numbers or staff costs, is why the University is in the situation it currently faces. 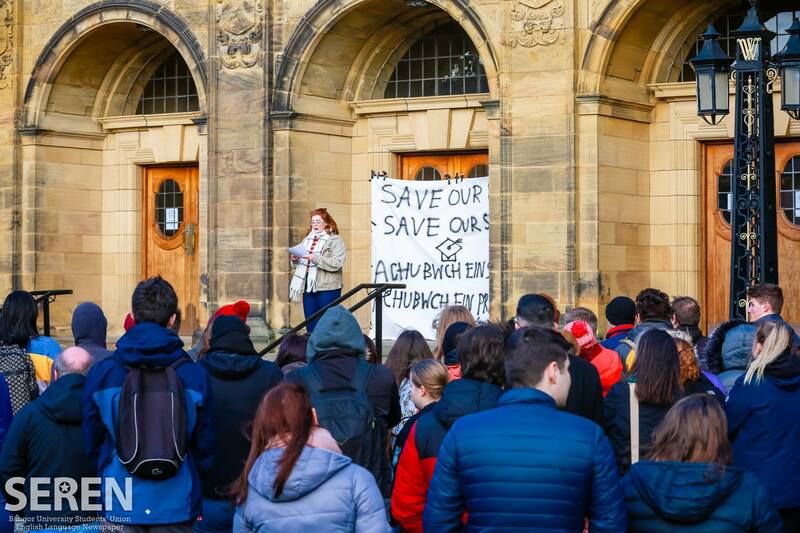 The University, in face of such publicised and founded opposition to its proposed cuts by its student body faces no choice but to listen to what we are saying. So lets use this platform to press home our point – we want to Save Our Staff to Save Our University. The consultation period has been extended to the end of the month so if you have not written in your complaints do so now. Equally the New Interim VC will be hosting a Q&A event in February so come along to quiz him and tell him that this course of action is not the correct way to go about things. The comments that the SU are collating are being relayed to university management in a very responsible manner. All questions and talking points are being raised to the university, and answers to each one are to be published on the Undeb Bangor webpage in due time. Although the amount of pressure the student body has put on the university has been plentiful, it’s important to see through this consultation period and ensure we do not lose momentum before then. Every last bit of pressure helps steer the university’s decision making in a more sensible direction. We have to keep up the pressure on the University, as students of this institution we owe it to the Staff that have made this University consistently one of the UK’s highest for student satisfaction. I for one won’t stop pestering and fighting until the University is safeguarding this jobs and seeking their cuts in other places – such as cutting expenses allowances, the 6 figure salaries of University Higher Ups or selling off the £800,000 property of the ex-VC that the Uni still own, alongside finding money in other places such as moving money from its reserves or finding sponsorships for its extended property. We can and will fight these cuts with all we have got, so lets keep the pressure up everyone! Any and all concerns can be sent to studentvoice@bangor.ac.uk. This article was written by Owen J Hurcum & Kayleigh Lavornia.